Taking the Pea founder Mike, a long time ‘hater’ of peas, first gave peas a chance when he munched on his first wasabi pea. To his surprise he quite enjoyed the crunchy texture and eye watering kick it came with. Being the health conscious, gym going, beach weights kinda guy he is, Mike was delighted with the nutritional benefits. However he realised there was pea discrimination was going on - they only came in one flavour! 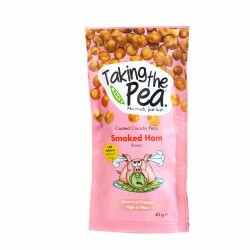 Mike has developed a range of delicious dried peas available in 4 familiar flavours; Wacky Wasabi (of course), Smoked Ham, Sweet Chilli Salsa and Cheesy Peasy & Onion. Go on...give peas a chance!